I love Beatrix Potter. Her dear sweet books are stacked on my bookshelves and music boxes are scattered around, along with adorable figurines. It seems I've been collecting them forever. 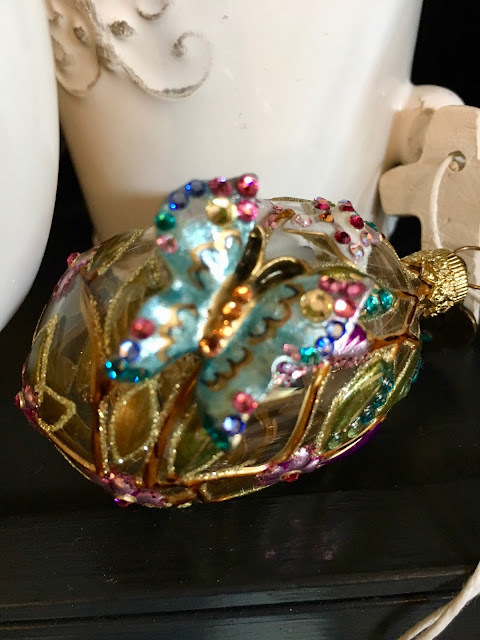 My mother-in-law really liked my collection and started her own, mostly ornaments. When she moved to a retirement home last year she wanted me to have her collection of ornaments. 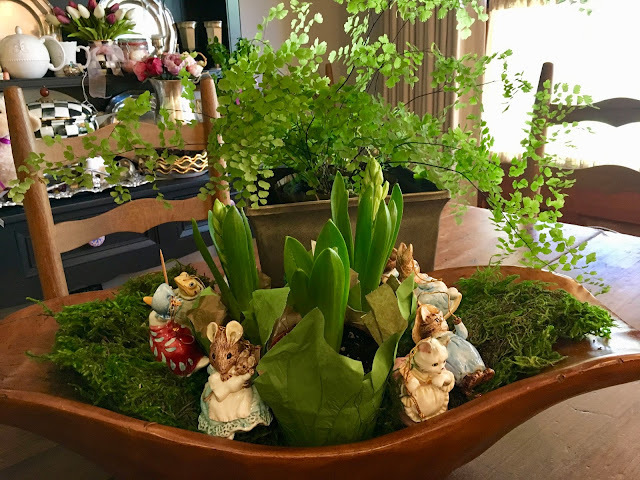 I decided to use them in a centerpiece for the table in the breakfast area of the kitchen. 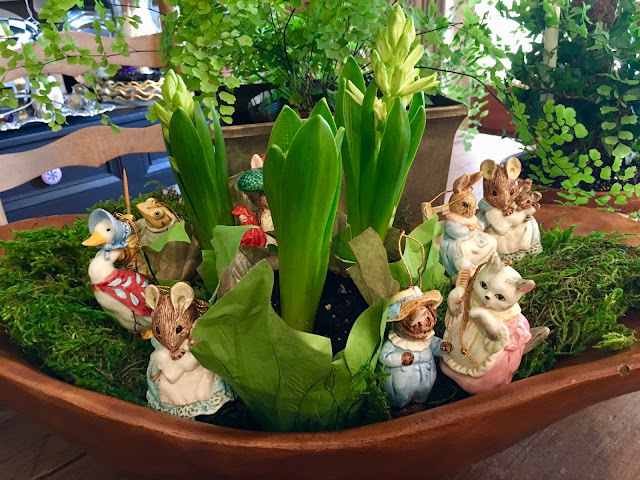 Using a wooden dough bowl I added moss and three small hyacinths, timed to bloom Easter, I hope. I love these adorable ornaments and this sweet lady! 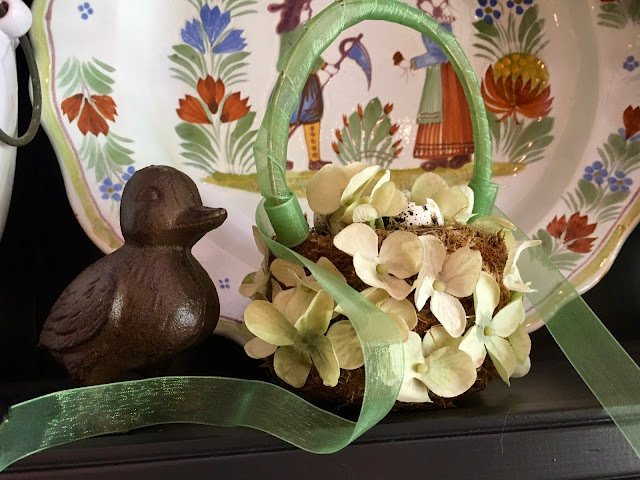 The Easter Bunny never forgets to deliver her basket. Even at 95 she gets a thrill and unwraps her basket immediately. She smiles and says, "I love candy, just one now!" If you would like to see more of my collections, visit these posts here and here. A few weeks ago I was the lucky winner of this gorgeous tote at The Painted Apron. 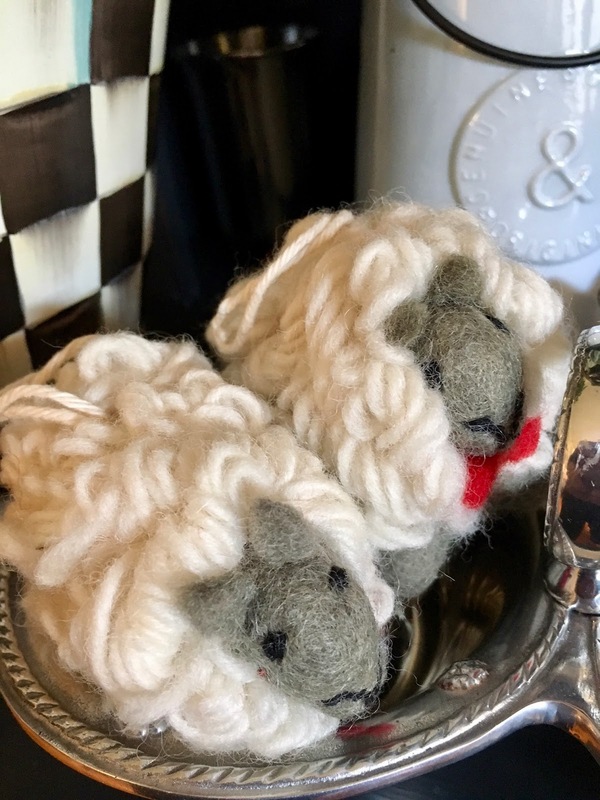 Thanks Jenna, I think it's perfect to take to market. 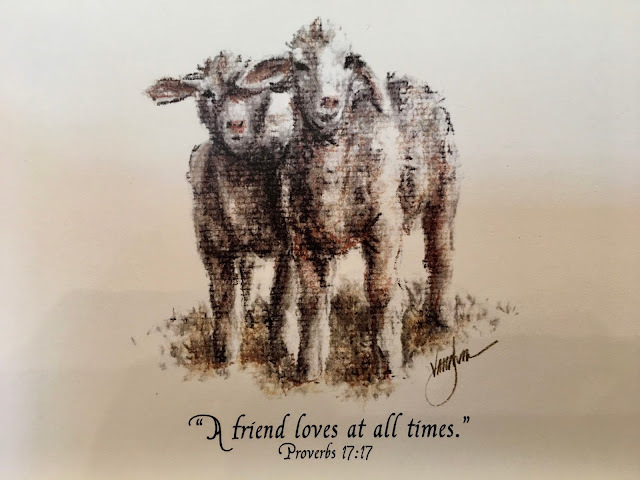 Wishing all of my friends a wonderful and joyous Easter. 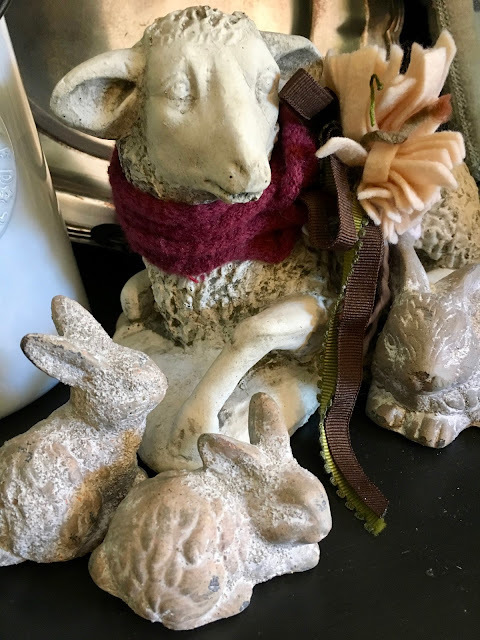 Beatrix Potter accessories and fabric was a big deal when my son was born, so I used a lot of it in his nursery. It brings back such sweet memories of a favorite childhood tale. I love how you've used the ornaments for a centerpiece. Yet another extra way to enjoy things that bring us joy! 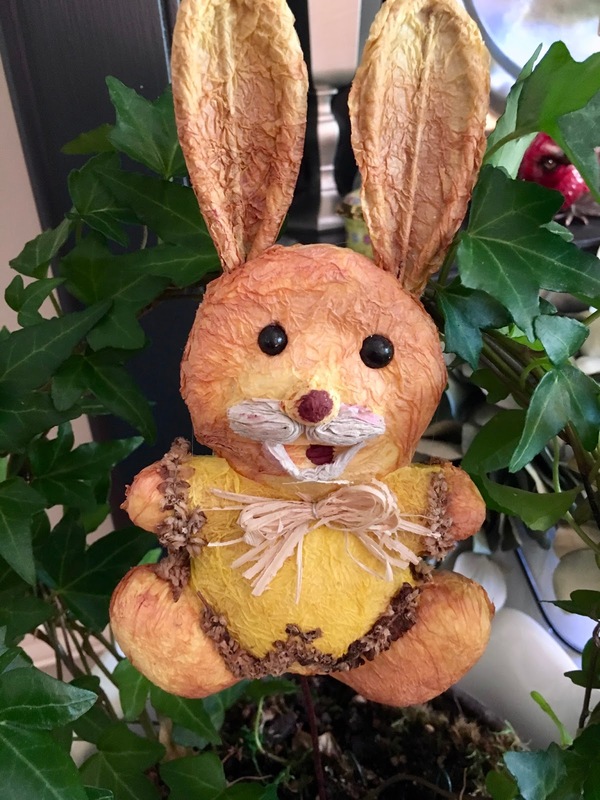 Happy and beautiful Easter to you! Oh, Emily. This is a gorgeous post. 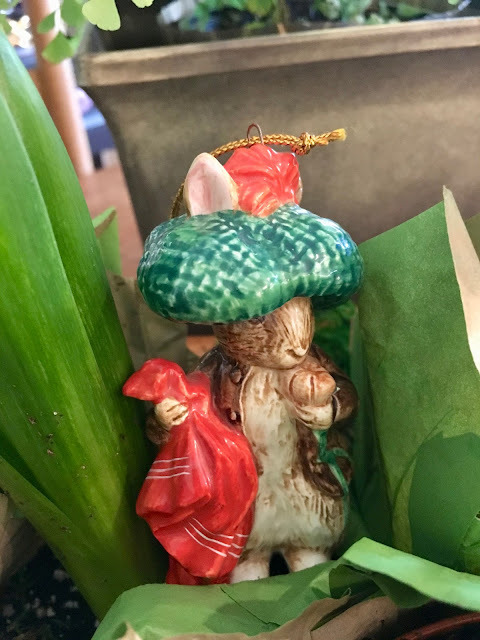 Your Beatrix Potter ornaments are adorable tucked into the moss and hyacinths! Delightful music as I enjoyed your pictures. Your hutch is over the top fabulous! 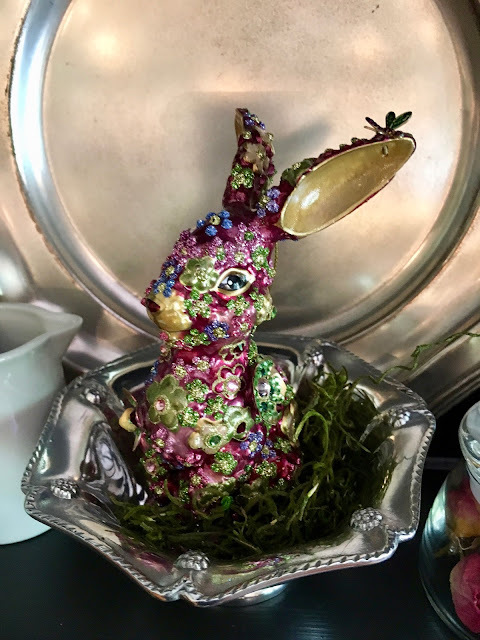 There are so many darling baskets dressed with ribbon, lambs, eggs,bunnies, butterflies, and MC pretty pieces honestly this should be in a magazine. I was touched by the picture of your MIL receiving her Easter basket! She is beautiful -be sure and tell her I said so. 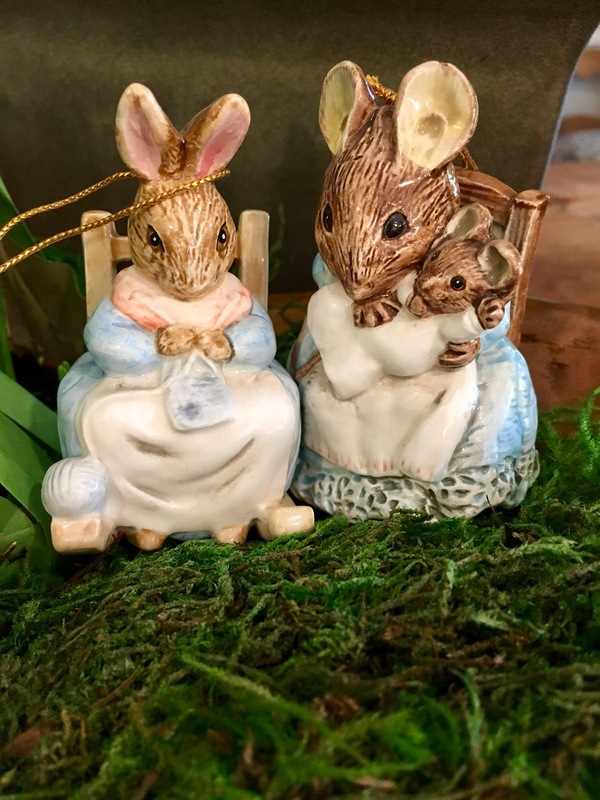 I adore Beatrix Potter everything--so adorable. I love what you did to your dough bowl. 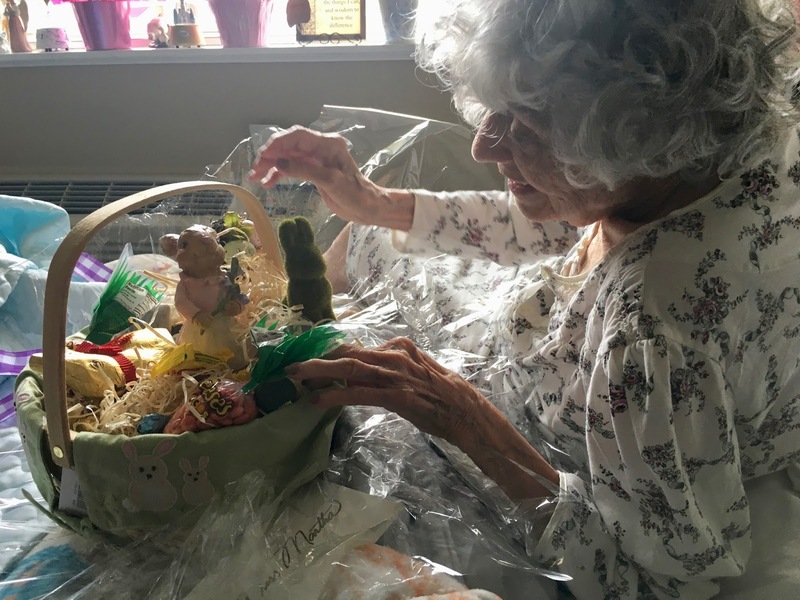 Taking care of those we love is whats it's all about---I love that she got an Easter Basket!! Emily, I'm scrolling back and forth taking it all in! You know Beatrix Potter is very special to me as well. I've not seen the ornaments like this before. They are adorable. 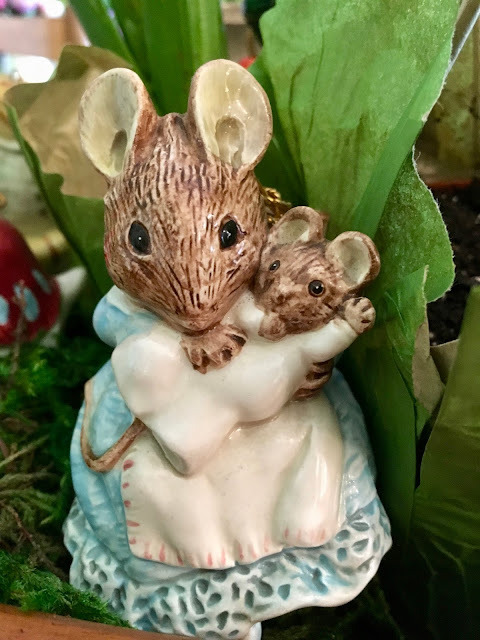 I've never had a collection of her figurines, but this past year have started a collection that I will give to my grandnieces when they are old enough to appreciate them and take care of them. So for I have found 4. Such a sweet photo of your MIL. She reminds me of Tash Tutor. I know she adores you and appreciates your thoughtfulness. Happy, Happy Easter, dear friend! Congrats on winning that GORGEOUS tote my friend! So pretty! 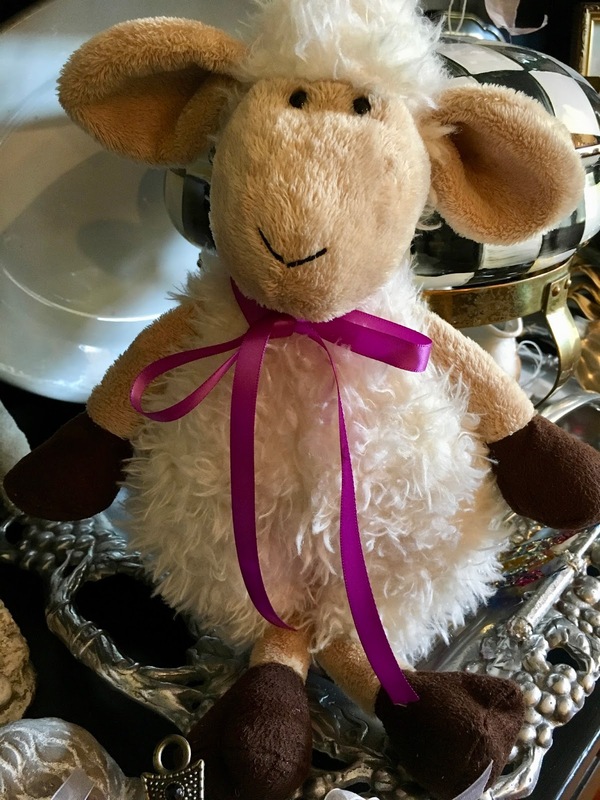 You have so many lovely things, and it's so wonderful that you took your mil's collection. I just know she's happy knowing her pretty things went to someone who appreciates them. This is so sweet! I love Beatrix Potter as well. I actually visited her house in the Lake District a few years ago but I was not a blogger then and didn't take any photos. Can you believe it? I'll have to go back. Happy Easter! Oh, Emily, what a totally delightful post! I absolutely adore your centerpiece, and to see that photo of your sweet MIL and that innocent smile on her face....how very special. Happy Easter, and thank you for such entertaining background music. This is exquisite, Emily. I love your centerpiece and especially love how you use things that are so precious to you in so many ways. 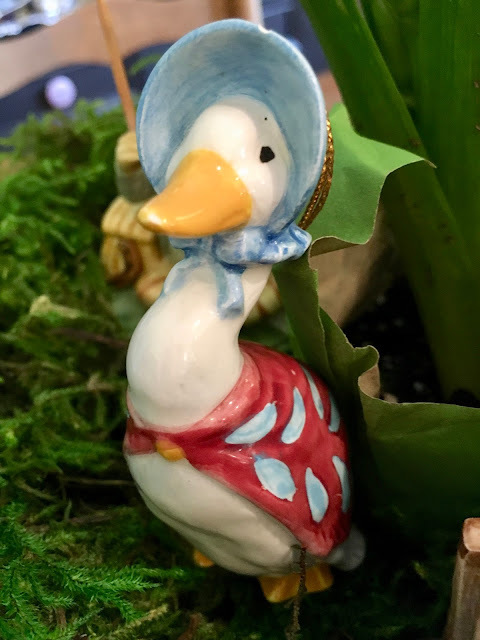 I love Beatrix Potter (there's a new book on her art out now -- I really want it!). I never collected the figures and wish I had. Probably too late to start now, so I'm glad you are sharing yours with us. Your home looks so beautiful for Easter. I love the photo of your mother in law. She looks like a kid in a candy store! Oh, I thin you will have a beautiful Easter filled with sweet treats, love and loads of memories! Every detail perfect as ever, Emily ...but OH THAT HEADER. Congratulations on the pretty tote. Impressive collection! My favorite photo, though, is of your MIL, the delight on her face over her Easter basket so obvious! That one is a real treasure. This is a beautiful post, and it warms my heart. It especially makes me happy to see your mother-in-law's joy at the simple, heartfelt gift of an Easter basket. Just goes to show that at 9, 5, or 95, there's a kid that lives deep in us all. Have a blessed Easter. OMG! I love every single one of you darling Easter touches! I hope that you have a very happy Easter, dear Emily! Oh you do it so well, you make it look effortless! I love your pictures, and your Potter treasures are amazing. Happy Pink Saturday, Emily. Thank you for joining us and for sharing all of your beauty. 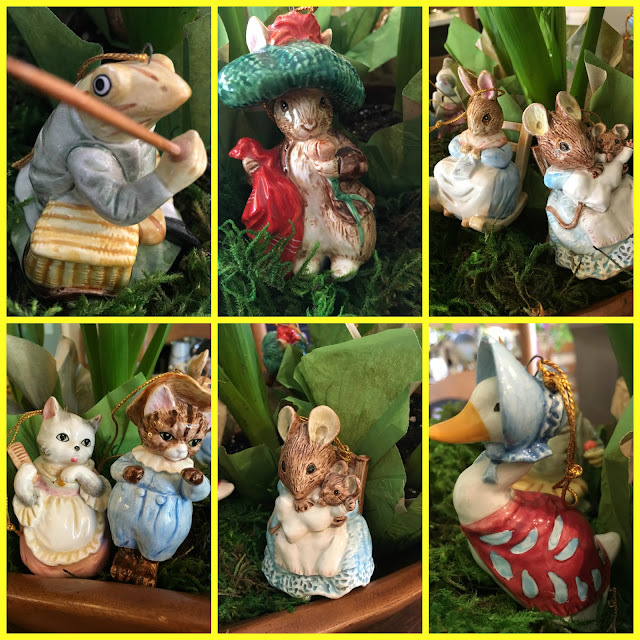 What a lovely Beatrix Potter Collection!Love all your pieces! Oh, Emily, I sure missed the details last time. The picture of your MIL and the Easter basket. <3 Made me cry. Off to see your other posts. What a great collection you have - and you hutch is so eye catching (you have some lovely MC pieces on there!!) Love your tote!! lucky you - Happy Spring! 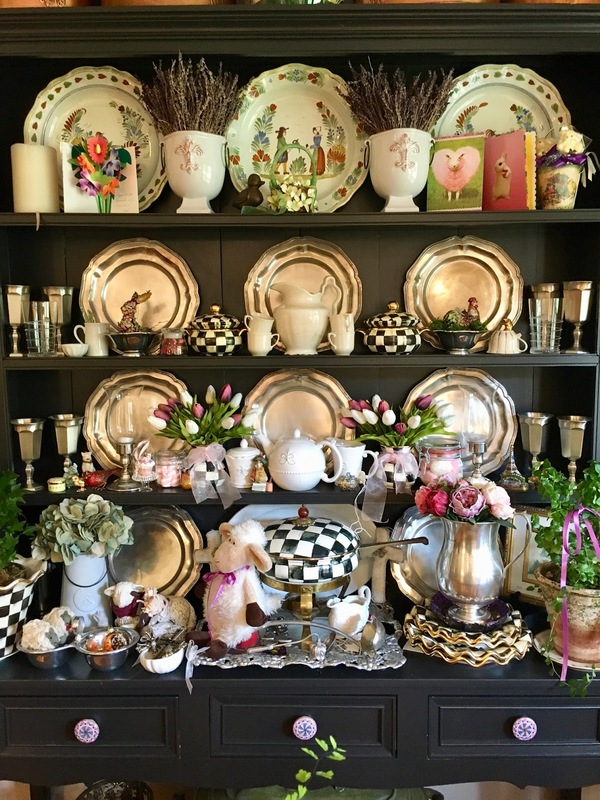 Such a sweet collection and I love that photo of your granny with her Easter basket. Brings tears to my eyes.... such dear hands. Reminds me of my grandmother. Life is so precious. Thanks for this post today! Happy spring, and happy Mother's Day, dear friend.